They’re both maroon and white. Both teams were originally the Aggies. One school brings cowbells to games while the other has the tradition of wearing overalls. Even their original names are oddly familiar – The Agricultural and Mechanical College of Texas and The Agricultural and Mechanical College of the State of Mississippi. Of course, if you haven’t figured out by now, I’m talking about Texas A&M and Mississippi State who will be meeting for the ninth time in the series’ history this weekend. Tied at 4-4, the series has seen about as many different results as you can imagine. From three straight shutouts (Two for Mississippi State as they won 6-0 in 1913 and 7-0 in 1915 with one for Texas A&M as they won 14-0 in 1937) to total blowouts to the iconic Snow Bowl where a freak snowstorm hit Shreveport, Louisiana the night before the Aggies and Bulldogs faced off in the 2000 Independence Bowl. Due to lack of regulations at the time, it wasn’t unusual for a school to be a member of multiple athletic conferences at once. Even more common was for a team to be a member of a conference while playing only a few opponents from that conference. The 1912 Texas A&M-Miss State matchup had a little of this flavoring added to it. With the Southwest Conference still a few years away, Texas A&M (the University of Texas also held membership for a time) had joined the Southern Intercollegiate Athletic Association (SIAA). The SIAA is largely considered the forerunner to the modern day SEC, but due to what can only be called an extensive and often bizarre membership, the SIAA would ultimately fold. In a time period when there were only four conferences (the SIAA; the Big 9 forerunner to the Big 10; the Missouri Valley Conference forerunner to the Big 8 and in part the Big 12; and South Atlantic Intercollegiate Athletic Association forerunner to the ACC) the SIAA had by far the biggest membership, both in total number and geographic footprint. On its own, the SIAA almost equaled the total numbers of schools in the other three conferences combined with 20 members. Spanning eight states (nine if you include Texas, but we’ll get to that more in a minute) the conference covered the entirety of the Deep South. The size of the conference would be unwieldy, if not impossible, in today’s world much less in the early 1900s. The most conference games any one school played was eight (that feat was accomplished by Georgia Tech, who certainly was one of the most centrally located schools in the conference, finishing with a 5-3 conference record). Texas A&M was nominally a member of the SIAA in 1912 but they only played two conference games, Tulane and Mississippi State. The only school to play fewer conference opponents was Kentucky State (now Kentucky). Due to this low number of SIAA opponents, some consider A&M an independent at the time while others still count the Aggies as an SIAA member. So it was that on that November day, Mississippi State came to Houston to face conference opponent (or at least quasi-conference opponent) Texas A&M. The Aggies of Texas were led by Charley Moran and undefeated at 5-0. Mississippi State was 4-2 entering the contest having lost to Auburn 0-7 and Tulane 24-27. However, the Aggies of Mississippi were a dangerous team and had knocked off Alabama 7-0 and LSU in Baton Rouge by a score of 7-0. The Aggies would have to play the game somewhat conservatively as they were entering the Mississippi State game as the beginning of a 12 day stretch that saw TAMU play four games (November 16 – Mississippi State, November 19 – Tulane, November 20 – Kansas State and November 28 – Baylor). It turned out Texas A&M shouldn’t have been worried at all. The final score was 41-7 TAMU, the largest victory for A&M in the series’ history. 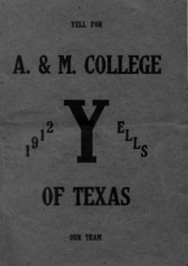 1912 TAMU Book of Yells. A&M's tradition of Yell Leaders began in 1907. Now undefeated at 6-0, the Aggies finished of their brutal schedule. Three days later, Texas A&M would dismantle Tulane 41-0, but in a one-day turnaround, the Aggies would fall 10-13 to Kansas State. Perhaps angered by their lone blemish on the season, A&M thundered past Baylor in their season finale 53-0. The Aggies finished the1912 season 8-1 while outscoring opponents 366-26. Their season point differential ranked among the best in the entire country, as fellow SIAA member Vanderbilt finished with the best differential, outscoring opponents 393-19. The Commodores would also be crowned the SIAA champion as they finished 8-1-1, but had a better conference record at 4-0-1 compared to the Aggies’ 2-0 record. 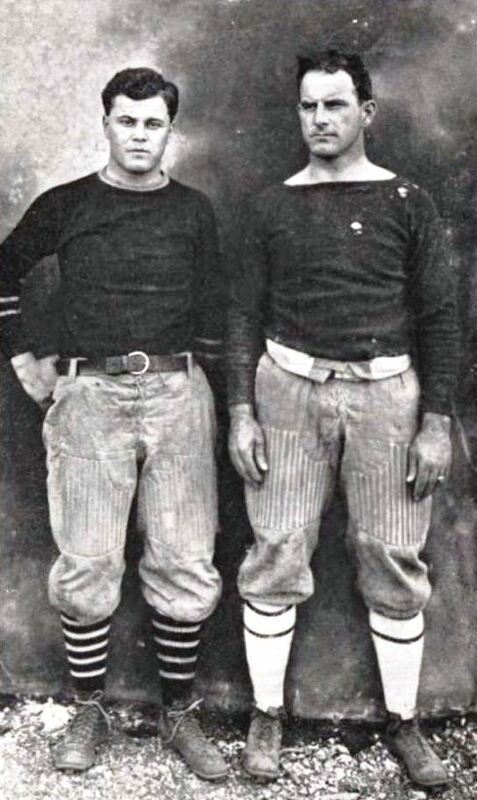 While the power of college football was viewed as the east coast with schools, such as, Harvard (the 1912 National Champion), Princeton and Yale topping the charts; the success of schools like Texas A&M and Vanderbilt were a telling sign of the coming geographical shift in college football. 1912 had another team that would help shift focus off the traditional powers – Carlisle. The Carlisle Indians led by Pop Warner and Jim Thorpe went 12-1-1 on the season and had the country’s highest scoring total with 454 points. The Indians even beat teams like Brown (32-0), Army (27-6) and Pitt (45-8). Fast forwarding 100 years, over 100,000 people will be in College Station to watch old conference foes face off again as new conference foes. With both teams ranked, the game promises to be a fun one. The 12th Man will be hoping to rekindle some of that 1912 magic and dominate the Bulldogs, stay undefeated and take another step towards a conference crown.